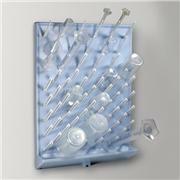 Drying tubes available with beaded or standard taper tops and standard taper bottom. 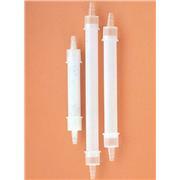 Drying tube adapter with inner joint and rubber stopper. 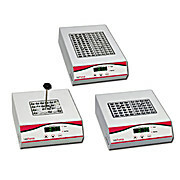 Synthware straight drying tube. 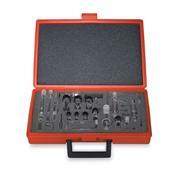 With top outer and lower inner standard taper joints of the same size. 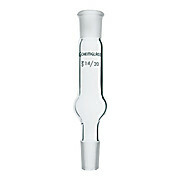 These U-shaped borosilicate glass drying tubes have a Standard Taper joint at one end and are designed to avoid desiccant contact with reaction. 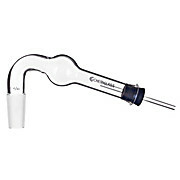 Other end is open to receive size a #2 rubber stopper with bent inlet tube (included). 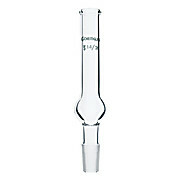 Vertical drying tube with a beaded top and lower inner joint. 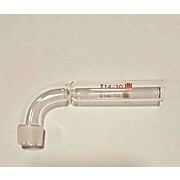 "U" shaped drying tube supplied complete with rubber stopper, glass inlet tube, and a lower inner joint. 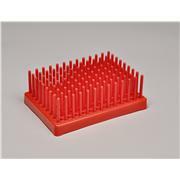 Schwartz type drying tube having 14/20 hollow stoppers. Stoppers have a hole that aligns with a serrated hose connection for on/off action. Overall height is approximately 170mm. Synthware drying tube angled at 75 degrees. Angled to avoid dessicant contact with reactions. With standard taper inner joint. 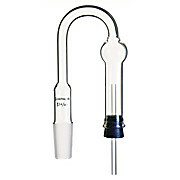 The 75º angle drying tube is for use in fume hoods where space is at a minimum. 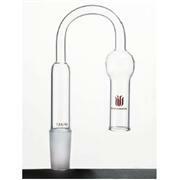 Supplied complete with rubber stopper, glass inlet tube, and a lower inner joint. 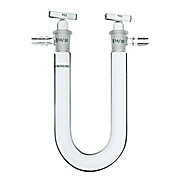 Synthware "U" shaped drying tube. With a lower inner standard taper joint. Cotton is typically used to contain drying agent. 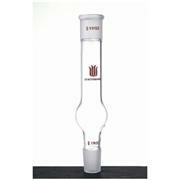 Drying Tube, 90 degree, Synthware, Joint: 14/10. 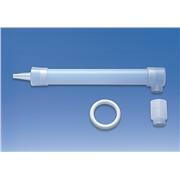 Drying tube with standard taper joint, supplied with rubber stopper. 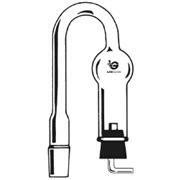 Bent gooseneck type drying tube. 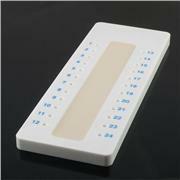 Code -02 uses #00 rubber stopper, code -04, uses #3. Microscale Drying Tube used to protect moisture sensitive reaction components from atmo- spheric water vapor while allowing a reaction system to be kept unsealed. With inner joint, bent 90 degree to main chamber. 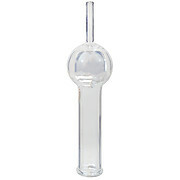 Similar to CG-1293 but with the addition of a top standard taper outer joint of the same size as the lower inner joint. 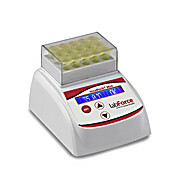 …racks can conveniently hold inverted tubes for drying and minimize collection or airborne contaminants. 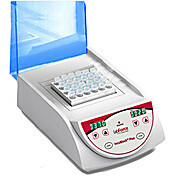 Racks can also be used to hold and dry electrophoresis and chromatography plates. Autoclavable. 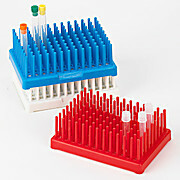 The 96 place rack features an 8 x 12 array of pegs that hold test tubes up to 13mm in diameter.